As is tradition in Leicester Symphony Orchestra, every two years we go on tour. This year was no different, and during the late May bank holiday, we departed for Leuven in Belgium. We had a relative lie in this year, with the coaches loading at the positively late time of 09.30 from our rehearsal base at the Mayflower Church in Leicester. We left in good time, only to get stuck in traffic on the notorious M1. After a tedious journey, we arrived an hour late for our ferry, with the result being that we had to wait for the next one. The crossing was calm and uneventful (although for a teatime crossing, there was a serious lack of cooked food!) and before we knew it we were in France. The journey continued on the opposite side of the road, through France and into Belgium, where we eventually got to our hotel. Most people were then extremely excited about the close proximity of the Stella Artois brewery, which was located over the other side of the road from us. We had to wait to explore that though, so relaxed with a few drinks in the hotel bar. On the Sunday, we all departed for the 90 minute journey to Dinant, where we had some time in the morning to explore the small riverside town. 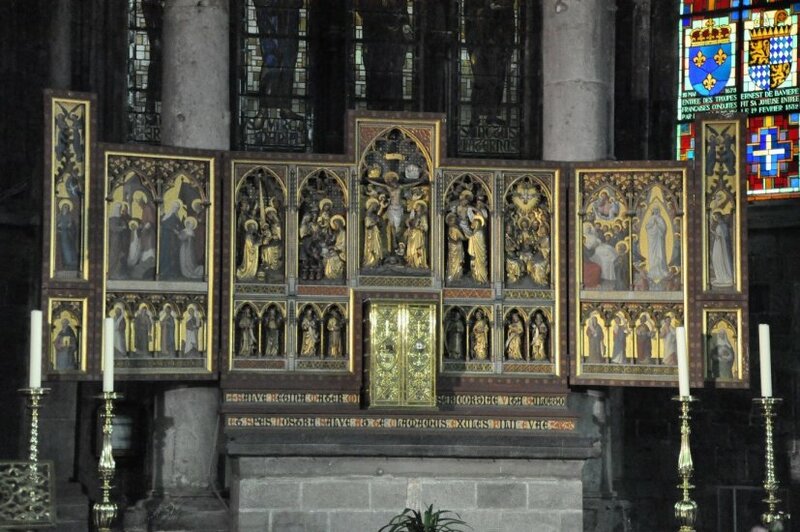 It is famous for being the birthplace of Adolphe Sax, the inventor of the Saxophone. 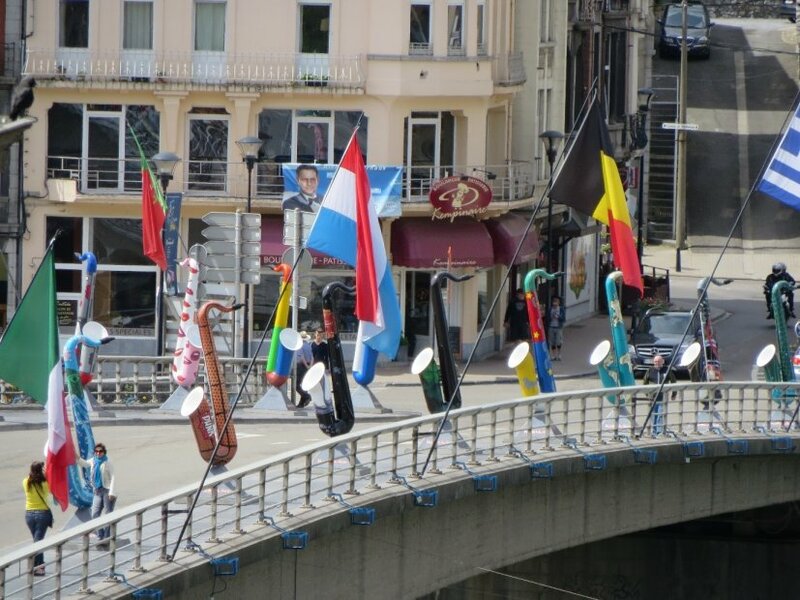 As a result, the town was adorned with brightly coloured saxophone statues, which made for a very cheerful visit. Dinant is also famous for its 11th Century citadel. This overlooks the town from the top of the limestone cliffs, up 408 steps. Some of us were brave enough to attempt these, others took the cable car up to have a look around. 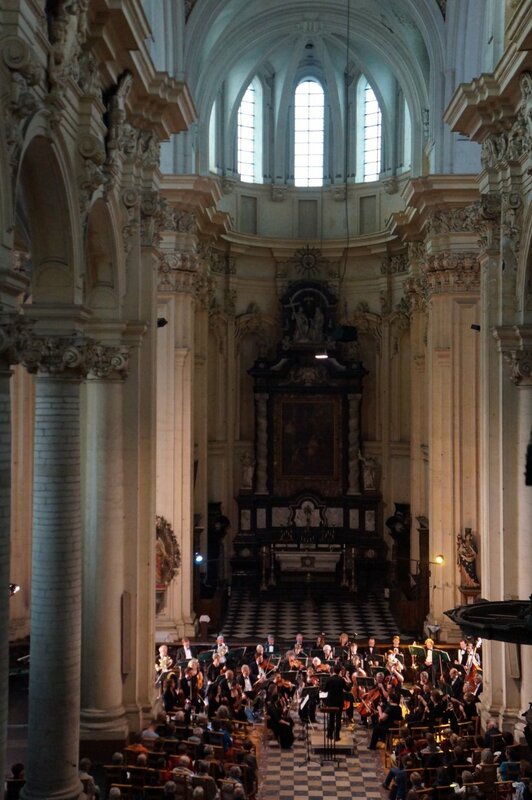 After a brief look around, and grabbing a quick bite to eat, it was time to rehearse in one of Dinant’s other famous sights: the Collegiale Church of Notre-Dame. 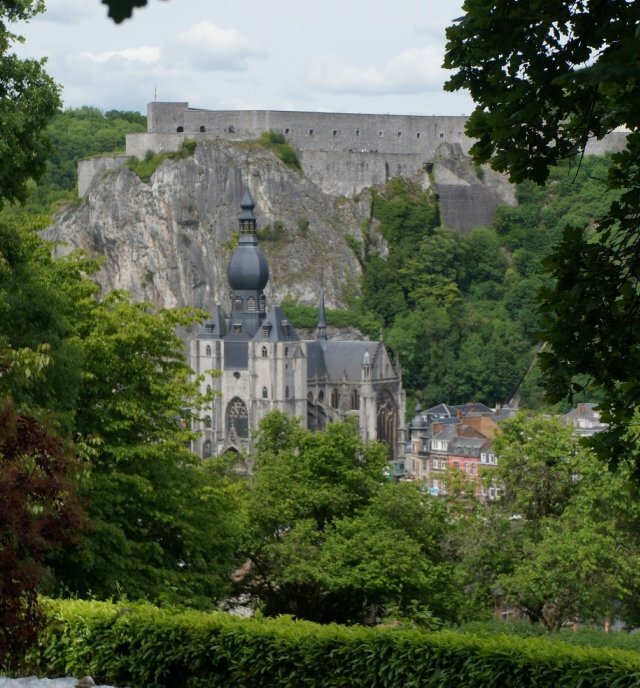 This is one of Dinant’s most striking buildings, and we were lucky enough to be able to perform a concert in it. The rehearsal started a little late, due to some furniture moving and a little logistical problem of trying to fit the tympani through the church doors (easier said than done!) but eventually we started and then we attempted to get to grips with the acoustics. After the rehearsal, we had a tea laid on for us. This was a feast and consisted of many baguette sandwiches. The dessert was more impressive, however with French tarts and pies of every flavour (the cherry was the tastiest) and what seemed like ‘all you can eat’ chocolate custard éclairs! Nicely stuffed, we all squeezed ourselves into our concert attire and started to play at 6pm. We performed Humperdinck: Hansel & Gretel Prelude, Holst: Somerset Rhapsody, Tomlinson: Sinfonietta No. 2 and Dvořák: Symphony No. 8. The concert seemed to go down well and we departed on the coach back to Leuven (complete with 2 boxes of chocolate custard éclairs for the journey that we had not been able to finish at tea!). We finished off the day by heading into town to sample some of Belgium’s famous beers. Ranging from 6% to as much as 12% (some even more, but we did not attempt these!) we managed to sample a surprising amount before heading back to the hotel. On Monday we had a free morning or the option to go on one of the two arranged excursions to Brussels or Waterloo. Both had good feedback from the participants. Waterloo battlefield was very interesting for those more interested in history. Brussels was a bustling capital city, but due to the traffic being terrible on the way there, and the vast size of the capital, there was limited time to explore. After the obligatory look at the Manneken Pis and a few other sights (including a few chocolate shops), we were back on the coach heading back to Leuven. Back in Leuven, we left the hotel on the coaches at 15.30 to travel to Sint-Michielskerk for another rehearsal and another concert. This concert was packed and we had an excellent introduction in Flemish to our audience. I am sure he was only being complimentary, however it is anyone’s guess as to what was actually said. This concert seemed to be received well and we finished it off with an encore of Dvořák Slavonic Dance Op. 46 No. 8. To celebrate we all went out to sample the local culture at one of the Belgian bars selling over 2000 different beers. I think as an orchestra as a collective, we certainly made a good start at sampling them all. The next day, some of the orchestra more dedicated to sampling the local culture went to the Stella Artois brewery for some hair of the dog to help them with the day ahead. Others just opted for a lie in and either had a free day, could go to Antwerp for sightseeing or could visit the famous Les Jardins d’Annevoie. 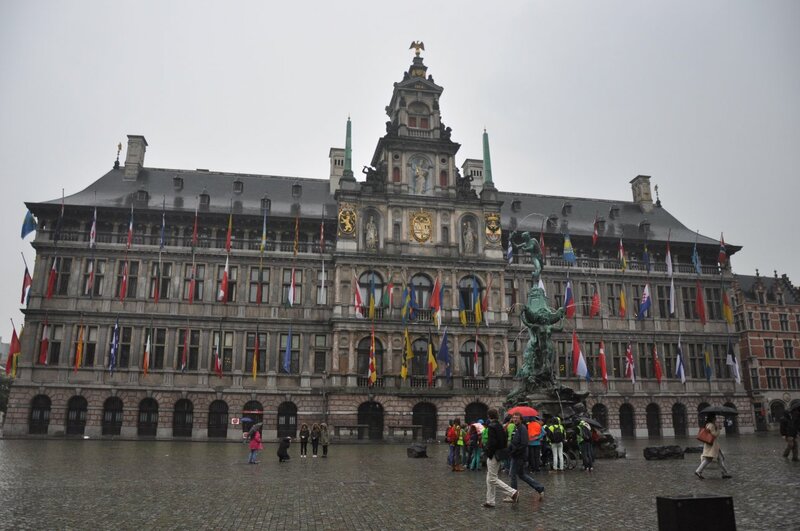 Unfortunately it was very heavy rain in Antwerp so there was limited sightseeing that we could participate in, however we all managed to visit the obligatory chocolate shops, and some of us even managed to visit the museum dedicated to the painter Rubens. The final day was ended back in Leuven at a small restaurant called Domus for our end of tour group meal. Before bed, we had an obligatory stop on the way home at ‘The Capital’ to try and sample the last of the Belgian culture. The next day was unfortunately our last. 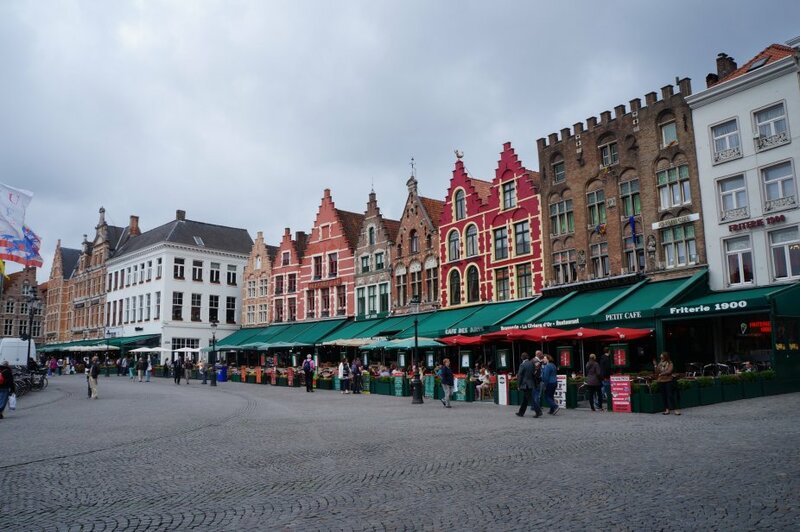 We drove back via Bruges, a lovely city albeit very busy during the time we were there. We managed to dodge the tourists, not get run over by the bikes, horses and carts and had a quick look around before heading back to the coaches to complete our return journey. Overall, this was as ever a very well organised tour. It encompassed many local sights (and tastes), whilst being able to perform to large audiences in some very spectacular venues. We as an orchestra certainly are very lucky to have such an exemplary tour organising committee as I certainly believe that these tours are integral to the good team bonds and friendships that we have as an orchestra.